Users may have trouble finding what they need on the site or they are experiencing problems with one of the site's functionalities. On complex site such as Web-based Application or E-commerce Site where users can have to go through a Registration process, or place orders, or do some other complex task users may experience problems and get stuck. Basically, the site must provide a service and the help page should assist users when they have trouble using the service. Add a 'Help' link to the Footer Bar or in the Meta Navigation. 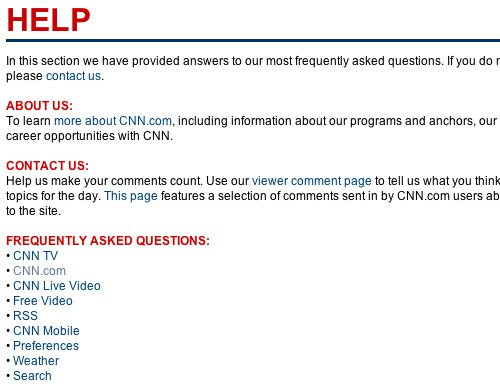 On the Help page itself provide answers to the most common problems users have with the site. This can be done in various ways and depends on the typical problems users encounter with the site. For example if you have a member section you may have user with problems remembering their username or passwords. When bookings can be done people may have questions about canceling or changing their booking. The help page can provide categorized help per topic or refer to other tools such as an Frequently Asked Questions (FAQ) or a Contact Page. This type of help is 'generic' and is not a replacement for contextual help that may appear in any particular section or during a particular process. Nonetheless. it may still be possible detecting where the user came from and try to guess what the user user might be having problems with. The footer is a good place to place a link to a help page because then it is always available. On the other hand it is also slightly invisible at the same time. In order for this pattern to work well it is important that the issues the Help page addresses really are problems users have. Therefore use information from the customer support center, emails and any other relevant resource to determine what people are having problems with and provide help on them. 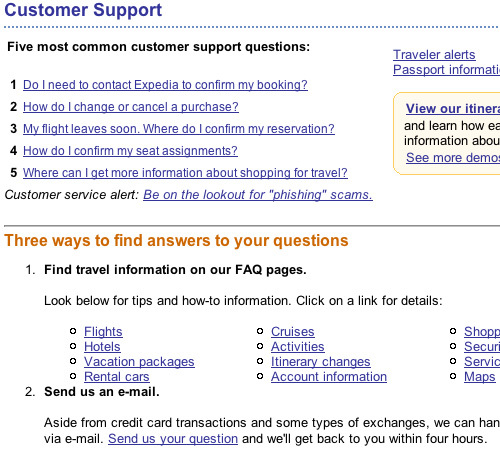 The Customer service page at Expedia provides a very extensive list of problems and possible solutions. In Addition I think a beautiful example of a help page is netflix's ' how it works'.